Xcaret offers lots of theme park choice in the Mayan Riviera and we picked Xplor and Xel-Ha to visit. 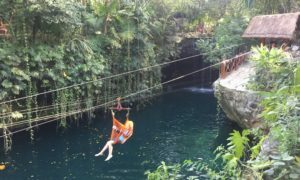 Our family loves adventure activities and Xplor didn’t disappoint with epic ziplines, amphibious vehicles through caves and swimming through the underground river network. Read our full review on visiting Xplor with kids. 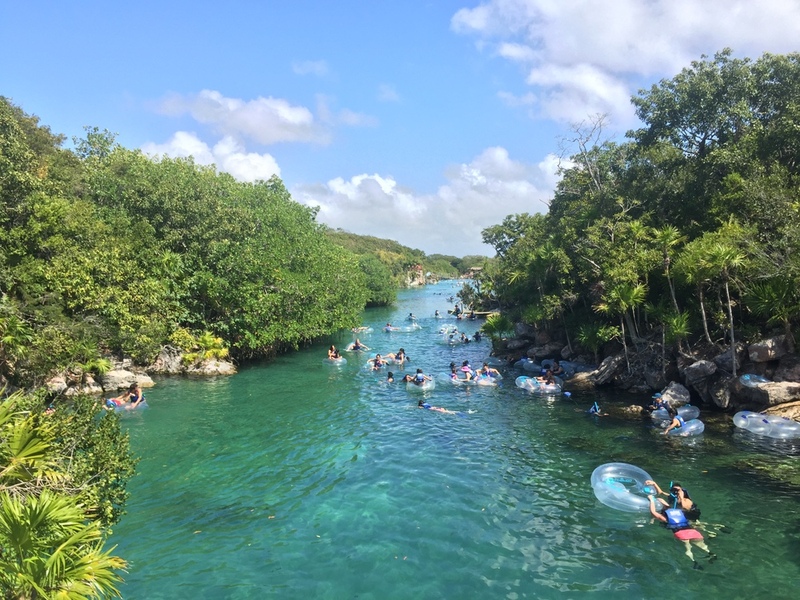 Whether you are visiting Mexico for a week or longer, the Xcaret parks are a must for families looking to enjoy the spectacular water and terrain of the region. After our awesome Xplor day, expectations were high for our visit to Xel-Ha. We hope you find our Xel-Ha review with kids helpful in planning your visit. 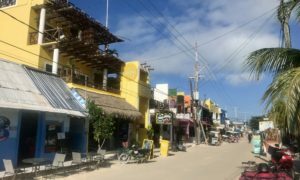 2 What to Do at Xel-Ha? Xel-Ha is a water park, but a water park unlike any we had ever visited before (and we have been to many!). Xel-Ha is set in a natural lagoon that flows into the ocean creating a protected area for swimming, snorkeling, and rafting. Xel-Ha caters to all types of visitors as there is something for everyone there. Our kids are 7-11 years old, but there is plenty to do for families with younger or older children too. The park operates as an all inclusive park with all base activities, drinks and meals included. There are additional activities that you can pay extra for (swimming with dolphins and rays and helmet diving). What to Do at Xel-Ha? This was the first activity our kids wanted to do when we arrived. The towering blue and white lighthouse is an icon of Xel-Ha and there are four 30 m water slides that take you down to the base. Adults need to accompany kids up the tower and kids should know how to swim if riding. You cannot take any cameras/gopros up, but there are free lockers at the base to leave them. Even if you don’t want to go down the slide, the lighthouse offers awesome views over the lagoon and ocean. While the whole of Xel-Ha is great for kids, the designated Children’s World offers some fun activities just for kids. Our kids loved the high ropes style playground and the water lily obstacle course. There are also lots of activities for little ones, including a small wading pool and playground. For the adults, there are comfy chairs to lounge in with waterfront views and easy access to the bar. You can walk to the river entrance, but we opted to take the free bikes for the 1 km ride to the entrance of the river. They have lots of bikes suitable for kids and it was a pleasant 10 minute bike on paved paths through the jungle. Although the bikes are in great shape, they take some getting used to as they only have pedal breaks. We have done lots of lazy rivers at water parks, but this gorgeous river is the ultimate natural lazy river. After getting off our bikes, we grabbed some tubes and floated along. Every one has to wear life jackets and there are comfy, clear single and double tubes to choose from. Along the way there are two cliffs of courage where you can drop 5 m into the water. Our kids particularly enjoyed climbing the rock face back up to the top of the cliff (there are holds to help). You can also choose to snorkel down the river and there is snorkel equipment available at the beginning of the river. This was our kids’ favourite area of Xel-Ha and we spent hours here. Located towards the end of the river, the Adventure Zone has fun activities to challenge your strength and perserverence. The ropes course is the perfect challenge for kids and adults alike. There is also a huge tight rope and slack line to try. The other activity in the Adventure Zone is the ziplines and hammock splashes into the lagoon. Our 7 year old was strong enough to hold on to the ziplines, but younger kids can still participate sitting in the hammocks. The day we visited the wind was really strong and the visibility wasn’t great for snorkeling. We did give it a try and did see some fish, but for those who have snorkeled a lot, this will not be the highlight of Xel-Ha. However, it is a great place for kids to try snorkeling with the easy entry stairs into the lagoon and calm waters. The snorkelling equipment was in good shape and there is lots of equipment for children. A lot of people are using full face masks now for snorkeling and if you want to use them, you will need to bring them yourselves. Our kids have been snorkeling since they were little and were perfectly comfortable using the provided traditional mask and snorkel. Xel-Ha is massive and there are lots of walking trails to explore. The Yucatan Peninsula is known for its cenotes, underground sink holes with refreshing fresh water. Xel-Ha has a number of them that you can view and one that you can swim in. It is much smaller than other cenotes we had visited in the Yucatan, but the kids enjoyed Chuc Kay’s rope swing. Our kids don’t stop, but Xel-Ha has lots of great lounging areas to simply relax with a drink in hand and look out over the turquoise water. We love the all-inclusive concept of Xel-Ha and Xplor. There are four restaurants at Xel-Ha, although we ate all our meals at the main buffet restaurant. Breakfast is served from 9:30 am, so we did a few activities and then had breakfast. Food is served until 5:30 pm, so you can also have a snack before you leave for the day. The buffet is massive and there are plenty of foods any child would be interested in. While I loved the fresh Mexican food and salad bar, the kids enjoyed the hot dogs, mash potatoes, jello and ice cream. The fresh churros with Nutella were so addictive too! The wait staff are friendly and efficient. There are numerous bars spread throughout the park and kids are not left out with fun mock tails like pina coladas and strawberry daiquiris to enjoy. Get there at park opening at 8:30 am to make the most of your day. Bring natural sunscreen. You cannot use traditional sunscreen in the park, although natural sunscreen is available for purchase at the shops. Wear water shoes, keens or flip flops. Towels, snorkel equipment, lockers all included. There are five hubs around the lagoon where you can pick up snorkel gear, towels and lockers. The equipment was all in good condition and hygienically cleaned. Be prepared to walk. The park is huge and if you want to see most of it, you will be walking a lot. It is possible to use a stroller with little ones as the pathways are paved. Go on water slides/tower first before it gets busy. Since the slide is so long, the wait time can get long. Parent needs to go up with kids. There are some lifeguards around, but you need to keep an eye on your kids. Life jackets are mandatory on the water activities and there are a variety of sizes for kids. Maximize the All inclusive – we ate breakfast, lunch and a late afternoon snack at Xel-Ha. Alcoholic drinks are served from 11-5. Bring a GoPro or Waterproof Phone Case – they sell these at the park, but you will want to have them to take photos of all the fun you are having. Photo package – there are lots of fun photo ops where you scan your bracelet and have a photo taken. Photo packages start at $58 USD. You can also take your own photos at these photo op spots. Feed the fish – At the steps into the water, you can get free fish food which will attract lots of fish. Optional extras – Dolphin Swim, Snuba, Sea Trek, Manatee Encounter, Sting Ray Encounter, Zip-Bike and the Adrenaline Boat are all available at an additional charge. At the entrance, there is a model of the Tulum ruins that are really fantastic. Don’t waste time at opening checking it out, but spent some time at the end of your day there. We hadn’t visited the ruins yet, but it was a great introduction to the site. Xcaret offers quite a few fantastic parks, each with a different style and flavour. Those staying at the Xcaret Hotel can visit all parks as part of their stay, but for most people, you will be choosing one park to visit. Xplor is perfect for families with school aged kids and teenagers who like adventure activities. The concept of the park is really unique and takes advantage of the natural environments of its Yucatan location. Xel-Ha is better for younger families and those more interested in relaxation and water sports. But really you can’t go wrong with either of them. We were super impressed with the activities, staff and organization of both parks. Xel-Ha tickets are comparable to what you would pay at any major theme park. Adult tickets are $89 USD/adult and kids are half price. With its all inclusive concept, there is a lot included in your ticket. You can purchase discounted tickets in advance on the Xel-Ha website. Xel-Ha is located 9 km north of Tulum and 110 km south of Cancun on the Mayan Riviera. You can purchase transportation with your Xel-Ha ticket, take a taxi or even ADO bus. We loved Xel-Ha and the only thing that would have made it better was if Paul could have been there with us (he was in Australia for work). Ella – “I loved all of it. There was so many different things to do. It had something for every one”. Disclosure: We were guests of Xel-Ha, but as always all opinions are our own. Save for later! PIN to Pinterest!